Our Value Guarantee: We take care of our customers regardless of their residency; however, we would like to take this opportunity to extend our genuine service guarantee to all Sunrise Manor residents. At Tucker’s Collision Center, all services are completed quickly and conveniently. If you have a vehicle in need of repair and live in Sunrise Manor, it is now time to consider who is the best collision service center for your car, truck, van, crossover, or SUV. Make no mistakes about it, Tucker’s Collision Center is the region’s best because of our customer service focus and customer satisfaction. We take care of our customers regardless of their residency; however, we would like to take this opportunity to extend our genuine service guarantee to all Sunrise Manor residents. At Tucker’s Collision Center, all services are completed quickly and conveniently. If you have a vehicle in need of repair and live in Sunrise Manor, it is now time to consider who is the best collision service center for your car, truck, van, crossover, or SUV. Make no mistakes about it, Tucker’s Collision Center is the region’s best because of our customer service focus and customer satisfaction. Vehicle owners in Sunrise Manor, Nevada sometimes don’t realize how close they are to a premier vehicle collision center. A quick 20-minute drive southbound on I-15 will deliver any Sunrise Manor resident directly to Tucker’s Collision Center in Las Vegas. If you live in Sunrise Manor and have a vehicle that can benefit from any level of collision repair service, look no further than us at Tucker’s Collision Center in Las Vegas. Tucker’s Collision Center is within driving distance for convenient body and paint services. Secure peace of mind knowing that we have a team of GM certified professionals ready to take care of your vehicle’s collision repair and body work services. 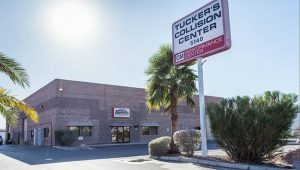 Tucker’s Collision Center in Las Vegas is fully staffed and prepared to take care of any level of body and paint work for most vehicles regardless of its make, model, or year. Tucker’s Collision Center in Las Vegas is conveniently located just off I-15. In fact, Tucker’s Collision Center in Las Vegas is a 20-minute drive down I-15 for most Sunrise Manor residents. Simply jump on NV-574 W to I-15 S, and voila, you are here and ready to receive the best collision repair services. Las Vegas has many “body shops” located on side streets and back alleys. Rest assured that the quality of service that you receive at Tucker’s Collision center matches the professionalism of the GM certified technicians doing the service. Tucker’s collision center is GM certified for a reason: we want our customers to feel the quality service guarantee when they step into the door. Better yet: we want our customers to know that the price they paid for service was well worth it when they pick up their vehicle. If you just realized that you should have been coming to Tucker’s Collision Center all along for minor body work and major collision repairs, it is time to schedule an appointment. We are conveniently located within a 20-minute drive from Sunrise Manor, NV. Call Tucker’s Collision Center in Las Vegas to have your vehicle repaired at a GM certified collision service center.